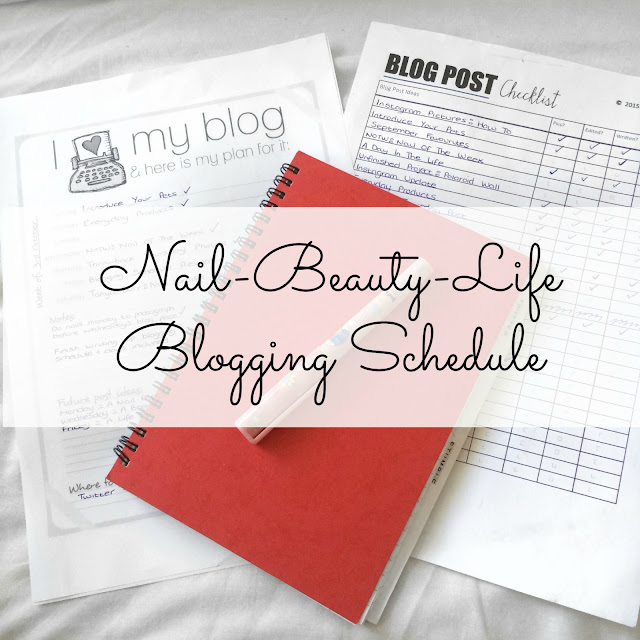 I thought it was about time Nail-Beauty-Life had a proper planned out blogging schedule, in the past I posted every 2 days, then I took it down to every 3 days but I haven't really stuck to these when I've been down visiting family in London. This week though I decided to give a week of blogging a go, and the only day I missed out on was a blog post for Tuesday not sure what happened there but I just didn't have anything typed up and ready to go as it was such a busy day for me. Credit to those bloggers who actually manage to post every single day, how you do it all the time I will never know as I found it pretty hard lol. There will be no posts over the weekends now, as I'm gonna take that time to catch up on normal everyday stuff, and to make sure I stay ahead of the blogging schedule the weekends will also give me time to take all blog photo's in one go so that I ain't having to worry about what picture will go with what. I will also take these 2 days to write out my blog plan for the week and also my blog post checklist that I have, I find having these 2 things to plan stuff out really helps me as it keeps me on track with whats gotta go up and when, and also how much time I have to do stuff. Plus with the new blogging schedule there is a little bit of something for everyone, and it also incorporates my blogs name Nail-Beauty-Life, so if your not a fan of say nail blog posts maybe the next 2 blog posts will be something your interested in.